Block other players if you can. Spending your turn to block someone don't gain much points, but else your opponent scores much more points if he can complete his route. Follow the eyes of your opponent to see which route he is planning. Once your route is complete, consider to start on a new one. With fewer trains remaining, the better play is to go for long links of opportunity. 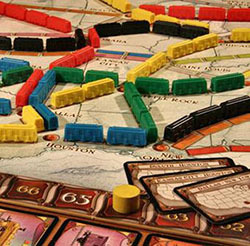 A 6-train link is 15 points even if it doesn't connect any city. 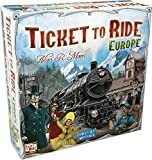 Don't be afraid to draw destination cards early in the game (especially the first few turns). When you have a long route trough the center of the board and you are waiting on cards of a certain color to finish a short route, it's better to give up on it and draw new routes. Pick up face-up locomotives when you can instead of lucky drawing 2 face down cards. On 1vs1 player games, you can save up cards in your hand longer and build your track at once. If you are far behind points, then draw 3 tickets. Hopefully, you pull a ticket that you already completed. 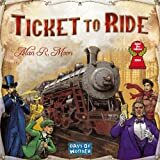 Play trains on longer routes to the same destination if possible. The scoring for 6 one-train routes or 3 two-train routes is worth much less than a single 5-train or 6-train route. Control the choke points and grab them early or your will be forced to go around. Draw from the top of the deck unless you need trains for a specific route. You don't want that your opponents know what you are doing because else they will block you. 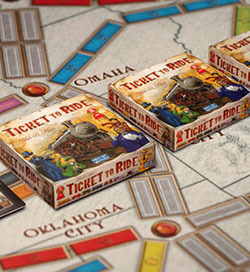 Place trains on the less optional routes first and save Locomotive cards until you absolutely need to play them. Focus on completing connections that require a certain color rather than gray (any color) connections. Collect colors that no one else wants. Select tickets that already exist within other completed tickets. Select tickets that already exist within other partially completed tickets. Select tickets that link up with current tickets. Concentrate your routes on the main cities that appear in a lot of routes.